FRESKO has collaborated with THE DENIZENS THEATER COMPANY to stage a performance of the play, MARISOL by José Rivera. 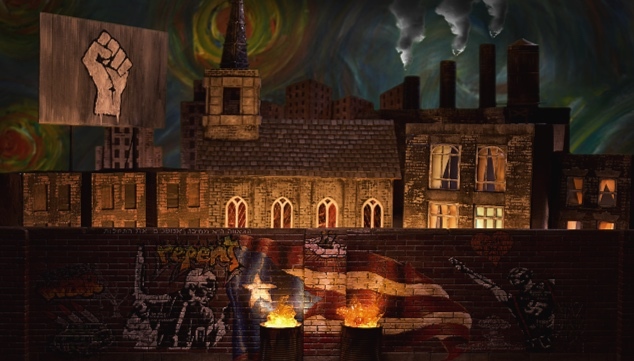 The play is set in an apocalyptic New York City, where a battle of cosmic proportions plays itself out on the streets of the South Bronx. THE DENIZENS, headed up by producers, Stephanie Moise and Lara Ruth Smith will be premiering the the new play at MÔTÔ Spirits, in Brooklyn, NY April 5th - 7th 2019, with more updates to follow. The minimalist staging of the piece features the directorial talents of Mr. Paul Mancini and an stop-motion animated multimedia scenic installation by Francisco Escobar. Paul is veteran writer/director of stage and screen and longtime FRESKO contributor. Francisco is the owner/operator of FRESKO Imageworks, and is a filmmaker and multi-disciplinary visual artist.